Here the general import parameters can be set. In the <Import types> objects group, the user can define the types of geometrical objects, which can be imported from the geometrical data exchange (CAD) files. If the box opposite a specific type isn't selected, then the corresponding object will be ignored during the import process. The <Import with Loop Checking (XT-always)> enables checking of "accidental" and inexplicable geometry standpoint's loops. If this options is enabled, this loops will be ignored. When model imported from XT-format, this checking will be do independently from options state. 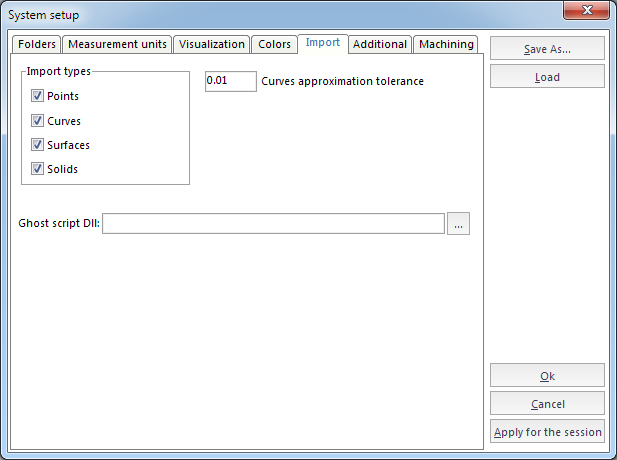 If during import a curve needs to be transformed, then approximation will be performed using the value specified in the <Curves approximation tolerance> window.